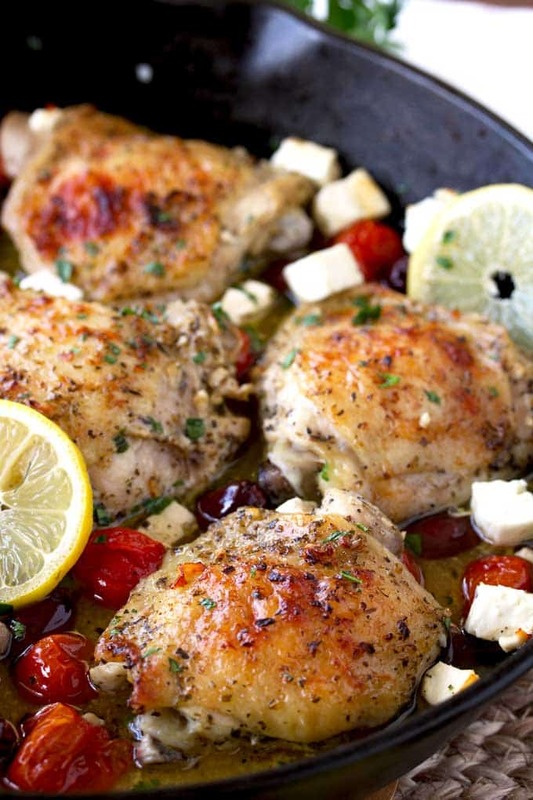 This Greek Lemon Oven Roasted Chicken is very easy to make and incredibly flavorful. 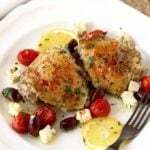 Roasted chicken thighs are quickly marinated in a few ingredients and baked with Kalamata olives, tomatoes and Feta cheese until crispy on the outside and tender and juicy on the inside. 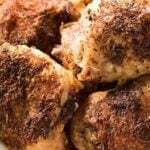 The perfect and quick baked chicken thighs dish everyone will love! Hi everyone, I am Kathy from Lemon Blossoms and this is my first time posting here. I am excited to be part of the contributor team at The Salty Marshmallow. I have been blogging for a little bit over a year although I have worked as a Chef my entire adult life (that feels like a long time!). 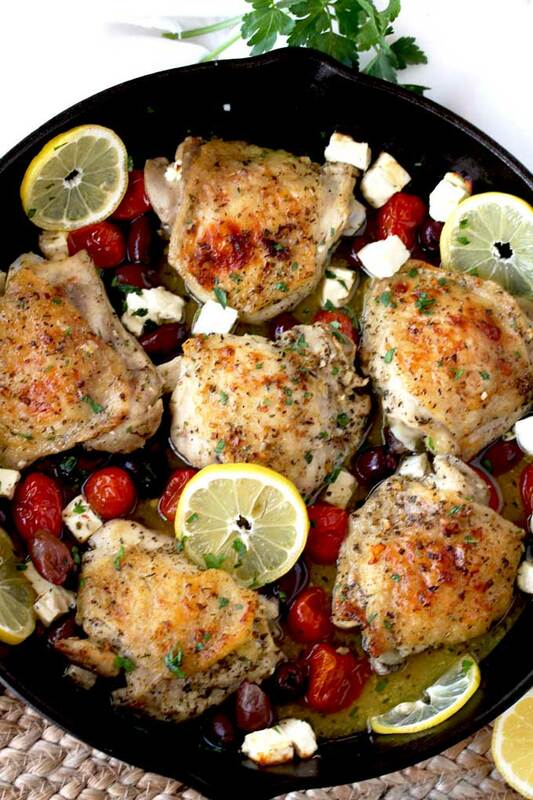 Greek Lemon Oven Roasted Chicken is one of those chicken recipes I make over and over again. Not only for its simplicity but for the amazing flavors you can achieve in a few simple steps and using one pan. The crispy skin is pure perfection, the chicken thigh meat is super flavorful and the pan juices are amazingly delicious! 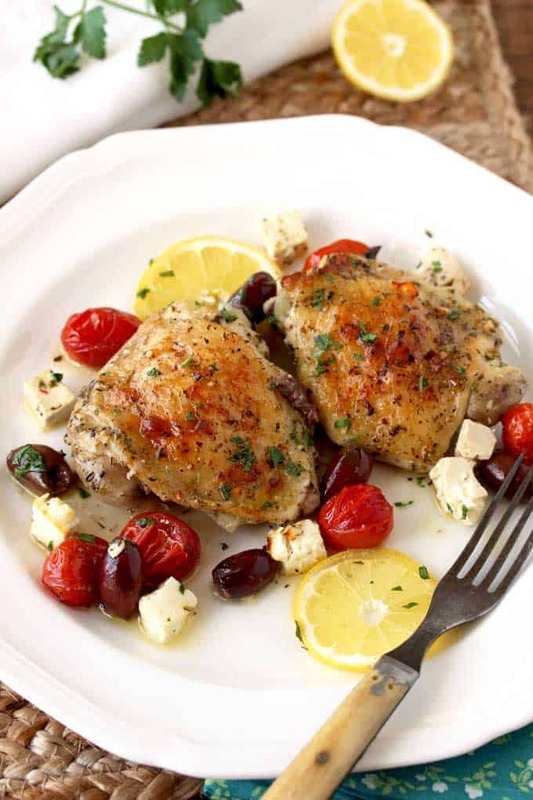 To top it all, roasted tomatoes, creamy feta cheese and briny Kalamata olives make this baked chicken thigh dish incredibly flavorful! I marinate the chicken thighs in olive oil, lemon juice, garlic, oregano, salt, pepper and a little bit of plain yogurt. The yogurt helps produce the most delicious pan sauce. Trust me you will want to drink the sauce with a spoon! You can marinate the chicken at room temperature for 15 minutes or you can refrigerate it and marinate it overnight if you have the time. I place all ingredients in a zip-top bag for easy cleanup. Next, you place the chicken with the marinade in an oven safe pan. I used a cast iron skillet but any baking dish works. Bake the chicken thighs at 375 degrees for 20 minutes. 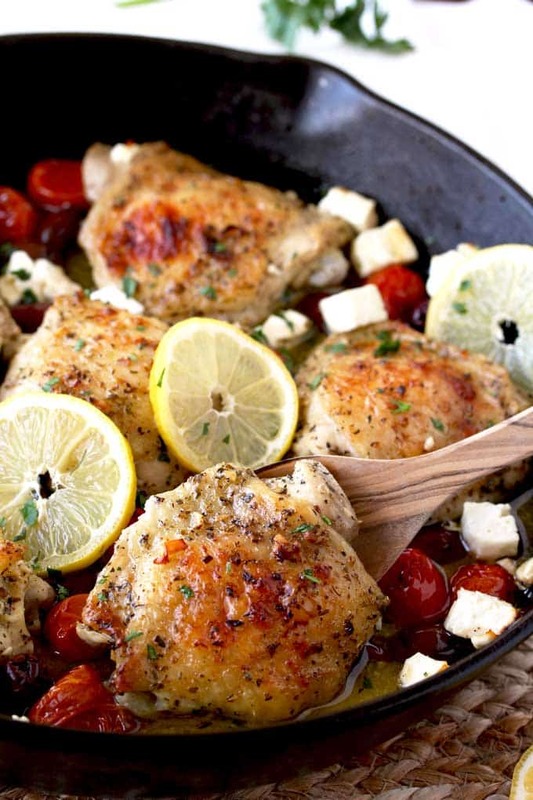 Remove the pan from the oven and top the chicken with Kalamata olives, cubes of feta cheese and tomatoes (any small tomato variety – like cherry or grape tomato – works well). Return to the oven and bake for an additional 15 to 20 minutes. Remove from the oven and enjoy! Love chicken thighs?Take a look at these Crispy Baked Chicken Thighs, they are easy to make and super tasty! Lightly season the chicken thighs with salt. Place the chicken into the marinade and mix to combine making sure the chicken is coat evenly. Marinate for 15 minutes or up to 24 hours. 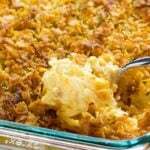 Return to the oven and bake for 15 to 20 minutes or until the chicken is cooked through and golden brown. Remove from the oven and serve. This was nice. Kalamata olives, feta, oregano, tomatoes and lemon are classic Greek pairings. I think perhaps next time, I will render the skins on the stovetop prior to baking, then scrape the pan halfway through the cooktime. We liked this a lot. I made it with boneless thighs, legs and wingettes. I put the legs in the oven about 10-15 minutes before the other parts so that they would be done at the same time. Great flavor and moist. I only marinated it for 30 minutes but next time will try longer and bet I get even better flavor. I didn’t add the salt and didn’t miss it. I typically serve it with rice and a Greek salad. Or you could also do lemon potatoes. All great side for this. Like yumy! I’m thinking make slurry to thicken sauce after cooking chicken to pour over e rice! 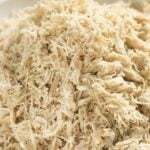 We enjoyed this very much with one exception, the skin is just too rubbery when cooked this way. I will remove the skin next time – or better yet, use skinless breasts. Otherwise, the flavor is very good. Marinated for about six hours. Excited to try the pulled pork next! So happy to have found your site! Thank you! I have never put yogurt as an ingredient for marinating the chicken. 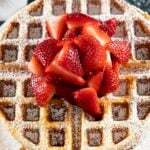 Has anyone tried this recipe? 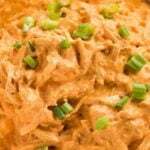 I tried this recipe and the marinade turned out great for the flavor in the end. When baking, the yogurt dissipates. Yogurt works well as a quick brine, tenderizing the chicken. Try marinating pork chops in buttermilk with seasonings! It does the same thing. This looks great however not feta cheese lover…any suggestions? Do you like goat cheese? That would work. 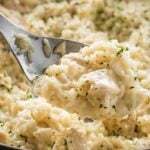 Does anyone know if this can be done with chicken breast? I have tried it with thighs and it’s delicious. This looks right up my alley! 🙂 I am going to have to add this to the weekly meal plan soon. Wow! This looks amazing. Love everything about this recipe. I’m hungry just looking at the Photos. I also like the simple ingredients. 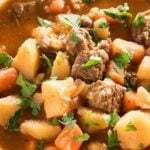 I have everything to make it so it will be on next week”s menu. This looks so delicious! I’ll be making this next week! Yum! We eat a lot of chicken meals and this is exactly what I need to change things up! Love greek flavors! This chicken looks so juicy and delicious! I need to make it soon! Love this, but I’m certain I will have to double the feta…or else by the time I serve it, there will be none left in the pan. Sounds like the perfect chicken dinner!